So, as I said in my last post, it took quite a bit of work to get Timberline's workflow worked out in Microsoft CRM. 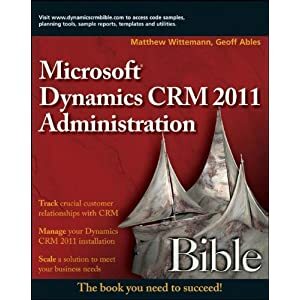 I ended up with a number of rules and subprocesses that I have been tweaking since going live with CRM companywide in September 2004. Initially I had overlooked part of the workflow that I had put in place that effected thousands of leads and made about 20,000 activities that were superfluous. One thing I am hoping for in the release of CRM version 2 is the ability to run actions against all the pages of a view. I had to delete these extra activities 100 at a time -- 200 pages worth! Not fun. One of the difficulties with Microsoft CRM's current workflow toolset is that it doesn't let you see the actual code you are creating. You just plug in statements from lists into If,Then statements. There is a Workflow monitor, but I have found this to be of limited use. It is helpful if you've accidentally created an infinite loop, and to abort workflow processes that are running, but it doesn't do a very good job if you are searching for a particular record or if you want to make sure your workflow is running as you expected. There also is a rather shameful lack of clear and complete documentation on CRM's workflow tools. Examples are scarce and even Microsoft Business Solutions' training materials aren't very comprehensive or clear about the logic that the workflow tool uses. I think CRM is a great product, and Microsoft was very ambitious to get as much in to version 1 and 1.2 as they did. I expect to see a number of good improvements in version 2, as my conversations with some folks on the MS CRM team have indicated they are highly committed to delivering an excellent product that reshapes the broader CRM marketplace. Anyway, I'd be glad to swap or share workflow XML files. If you are having problems with your workflow, let me know and I'll see if I can help. At the very least I'll lend a sympathetic ear, and I may even be able to point you in the right direction to successfully complete your deployment! I know this is an old post but my company is installing Microsoft CRM as a front end to an old IBM AS/400 for out trouble ticketing system and of course our customer database (we are a local internet and phone company). I am very green as far as writing code but I am eager and willing to learn how to make CRM work for our company. I am interested in seeing some of your workflow "templates" or examples.